They are practical multi-function drives with design-related strengths: The consistent power delivery and precise dynamics of the S..CMP.. helical-worm servo gearmotors are impressive. This means they are also smooth running in operation. 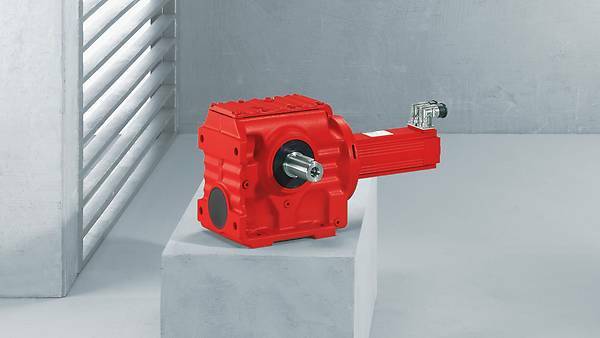 The S..CMP.. helical-worm servo gearmotors have a torque range of 92 Nm to 520 Nm. As angular drives they are especially space-saving and reduce the expenditure for valuable installation space. The helical-worm servo gearmotors are designed in such a way that they guarantee you a low-noise system environment. Moreover, these gearmotors offer you excellent attenuation properties for the operation of your systems with low levels of vibration. This is because of the longitudinal application of force on the input shaft. This allows torque impulses to be prevented effectively and for optimum results in terms of running smoothness and noise reduction to be achieved. Both the gear unit, and the synchronous servomotor are based on our modular system. This enables you to have fully individual configuration possibilities for each application. One thing is certain – Our servo gearmotors are real specialists for very specific requirements. to give your systems a high degree of dynamics with optimum attenuation properties as well. so that you can plan and implement your plant to best utilize your space. for a noise-reduced system environment and particular requirement profiles.